In this course you will learn how to add face recognition capabilities to a mixed reality application, using Azure Cognitive Services, with the Microsoft Face API. Azure Face API is a Microsoft service, which provides developers with the most advanced face algorithms, all in the cloud. The Face API has two main functions: face detection with attributes, and face recognition. This allows developers to simply set a set of groups for faces, and then, send query images to the service later, to determine to whom a face belongs. For more information, visit the Azure Face Recognition page. Use a Tap Gesture to initiate the capture of an image using the on-board HoloLens camera. Send the captured image to the Azure Face API service. Receive the results of the Face API algorithm. Use a simple User Interface, to display the name of matched people. 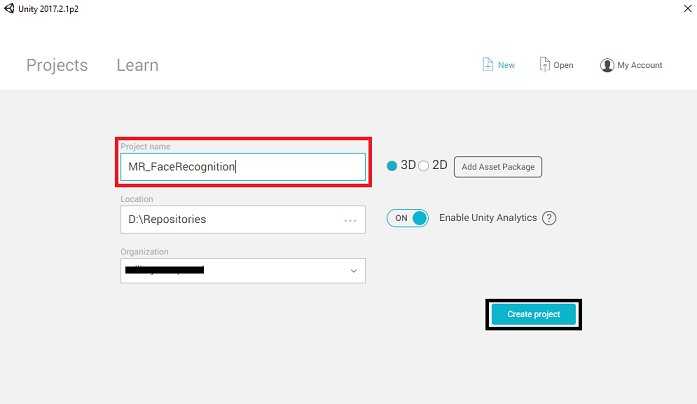 This will teach you how to get the results from the Face API Service into your Unity-based mixed reality application. To use the Face API service in Azure, you will need to configure an instance of the service to be made available to your application. Once you are logged in, click on New in the top left corner, and search for Face API, press Enter. The new page will provide a description of the Face API service. At the bottom left of this prompt, select the Create button, to create an association with this service. Select the pricing tier appropriate for you, if this is the first time creating a Face API Service, a free tier (named F0) should be available to you. The UWP app, Person Maker, which you use later, requires the use of 'West US' for location. Once you have clicked on Create,* you will have to wait for the service to be created, this might take a minute. When you are ready, click Go to resource button in the notification to explore your new Service instance. Within this tutorial, your application will need to make calls to your service, which is done through using your service's subscription 'key'. From the Quick start page, of your Face API service, the first point is number 1, to Grab your keys. On the Service page select either the blue Keys hyperlink (if on the Quick start page), or the Keys link in the services navigation menu (to the left, denoted by the 'key' icon), to reveal your keys. Take note of either one of the keys and safeguard it, as you will need it later. Make sure to download the prebuilt UWP Application called Person Maker. This app is not the end product for this course, just a tool to help you create your Azure entries, which the later project will rely upon. 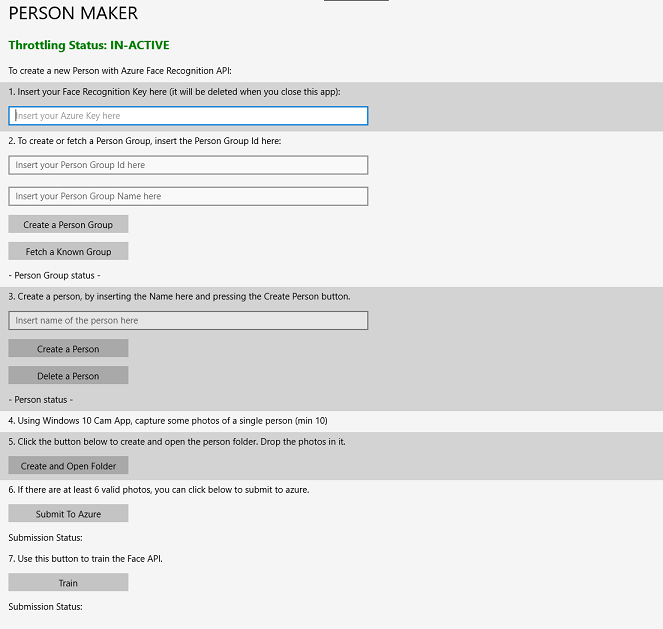 Person Maker allows you to create Azure entries, which are associated with people, and groups of people. The application will place all the needed information in a format which can then later be used by the FaceAPI, in order to recognize the faces of people whom you have added. [IMPORTANT] Person Maker uses some basic throttling, to help ensure that you do not exceed the number of service calls per minute for the free subscription tier. The green text at the top will change to red and update as 'ACTIVE' when throttling is happening; if this is the case, simply wait for the application (it will wait until it can next continue accessing the face service, updating as 'IN-ACTIVE' when you can use it again). This application uses the Microsoft.ProjectOxford.Face libraries, which will allow you to make full use of the Face API. This library is available for free as a NuGet Package. For more information about this, and similar, APIs make sure to visit the API reference article. Create a Person Group, which is a group composed of several people which you want to associate with it. With your Azure account you can host multiple Person Groups. Create a Person, which is a member of a Person Group. Each person has a number of Face images associated with it. Assign face images to a Person, to allow your Azure Face API Service to recognize a Person by the corresponding face. 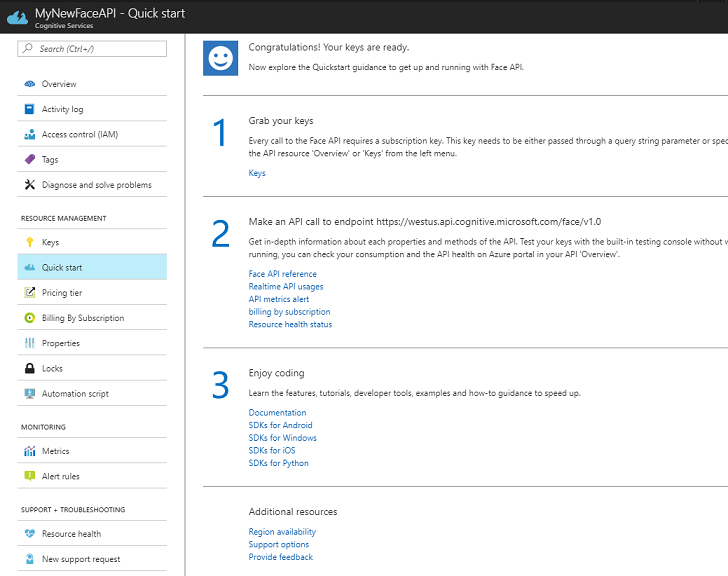 Train your Azure Face API Service. Be aware, so to train this app to recognize people, you will need ten (10) close-up photos of each person which you would like to add to your Person Group. The Windows 10 Cam App can help you to take these. You must ensure that each photo is clear (avoid blurring, obscuring, or being too far, from the subject), have the photo in jpg or png file format, with the image file size being no larger 4 MB, and no less than 1 KB. If you are following this tutorial, do not use your own face for training, as when you put the HoloLens on, you cannot look at yourself. Use the face of a colleague or fellow student. 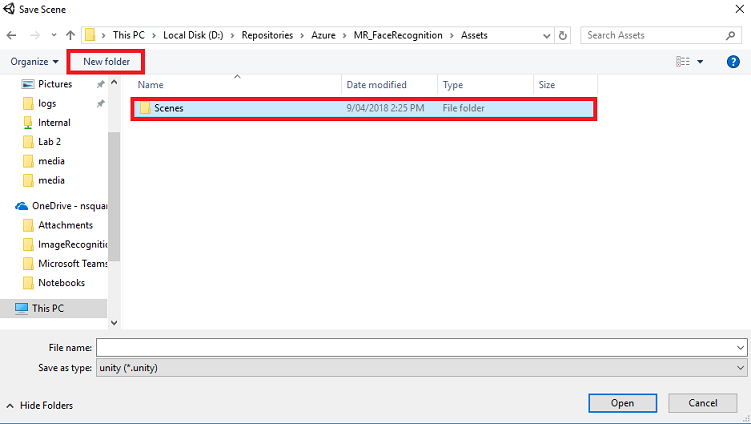 Open the PersonMaker folder and double click on the PersonMaker solution to open it with Visual Studio. The Solution Configuration is set to Debug. The Target Platform is Local Machine. 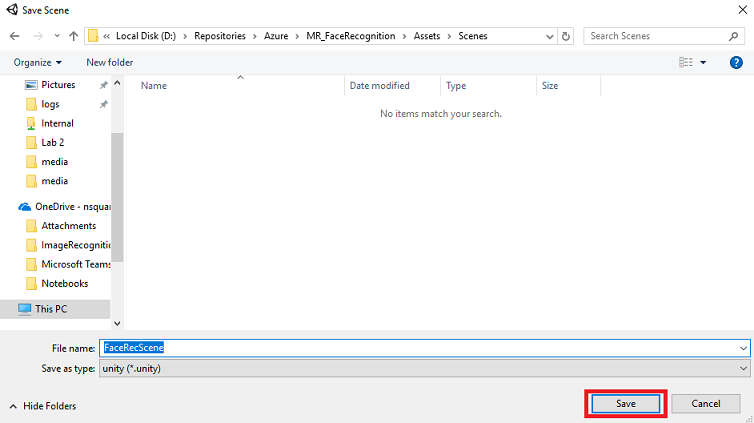 You also may need to Restore NuGet Packages (right-click the Solution and select Restore NuGet Packages). Click Local Machine and the application will start. Be aware, on smaller screens, all content may not be visible, though you can scroll further down to view it. Insert your Azure Authentication Key, which you should have, from your Face API service within Azure. The ID you want to assign to the Person Group. The ID must be lowercase, with no spaces. 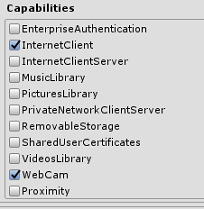 Make note of this ID, as it will be required later in your Unity project. The Name you want to assign to the Person Group (can have spaces). Press Create Person Group button. A confirmation message should appear underneath the button. If you have an 'Access Denied' error, check the location you set for your Azure service. As stated above, this app is designed for 'West US'. You will notice that you can also click the Fetch a Known Group button: this is for if you have already created a person group, and wish to use that, rather than create a new one. Be aware, if you click Create a Person Group with a known group, this will also fetch a group. Insert the Name of the Person you want to create. Click the Create Person button. A confirmation message should appear underneath the button. Make sure you know the location of ten (10) photos of the person you would like to add to your group. Press Create and Open Folder to open Windows Explorer to the folder associated to the person. Add the ten (10) images in the folder. These must be of JPG or PNG file format. Click on Submit To Azure. A counter will show you the state of the submission, followed by a message when it has completed. Once the counter has finished and a confirmation message has been displayed click on Train to train your Service. Once the process has completed, you are ready to move into Unity. You will now need to provide a Unity Project name. Insert MR_FaceRecognition. Make sure the project type is set to 3D. Set the Location to somewhere appropriate for you (remember, closer to root directories is better). Then, click Create project. Select the New folder button, to create a new folder, name it Scenes. Open your newly created Scenes folder, and then in the File name: text field, type FaceRecScene, then press Save. Scripting Runtime Version should be Experimental (.NET 4.6 Equivalent). Changing this will trigger a need to restart the Editor. 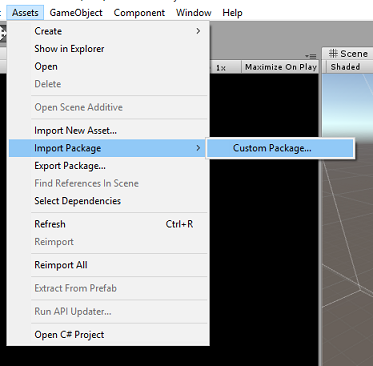 If you wish to skip the Unity Set up component of this course, and continue straight into code, feel free to download this .unitypackage, and import it into your project as a Custom Package. 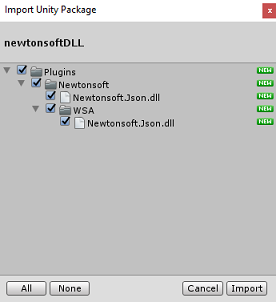 Be aware that this package also includes the import of the Newtonsoft DLL, covered in Chapter 5. With this imported, you can continue from Chapter 6. If you imported the '.unitypackage' in the last Chapter, you can skip this Chapter. To help you deserialize and serialize objects received and sent to the Bot Service you need to download the Newtonsoft.Json library. 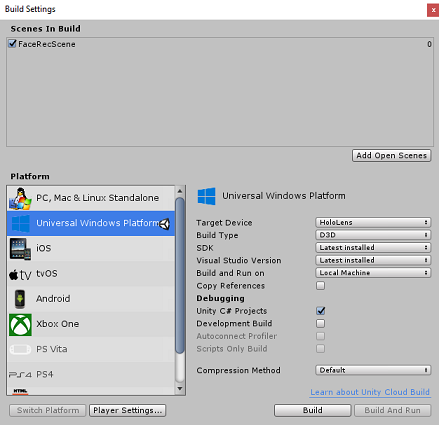 You will find a compatible version already organized with the correct Unity folder structure in this Unity package file. Click on Assets, Import Package, Custom Package. Look for the Unity Package you have downloaded, and click Open. Make sure all the components of the package are ticked and click Import. The purpose of the FaceAnalysis class is to host the methods necessary to communicate with your Azure Face Recognition Service. After sending the service a capture image, it will analyse it and identify the faces within, and determine if any belong to a known person. If a known person is found, this class will display its name as UI text in the scene. 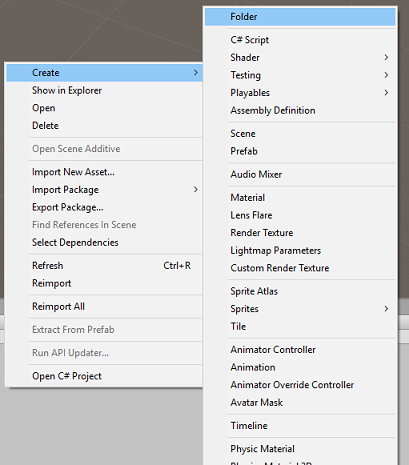 Right-click in the Assets Folder located in the Project Panel, then click on Create > Folder. Call the folder Scripts. Right-click inside the folder, then click on Create > C# Script. Call the script FaceAnalysis. Double click on the new FaceAnalysis script to open it with Visual Studio 2017. 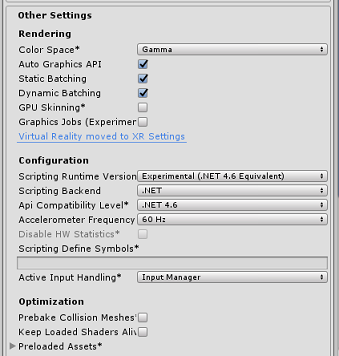 You now need to add all of the objects which are used for deserialising. These objects need to be added outside of the FaceAnalysis script (beneath the bottom curly bracket). The Start() and Update() methods will not be used, so delete them now. Replace the key and the personGroupId with your Service Key and the Id of the group that you created previously. 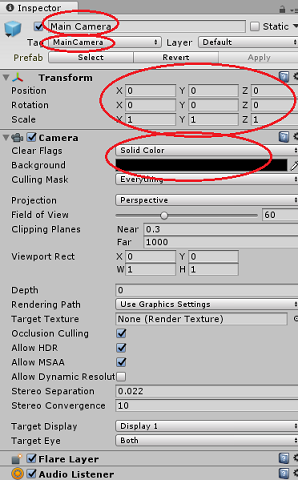 Remember to Save the changes before going back to the Unity Editor. 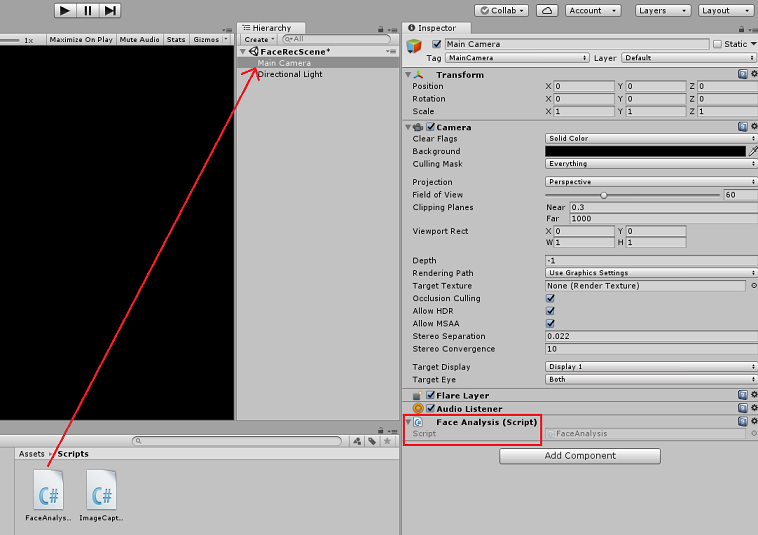 In the Unity Editor, drag the FaceAnalysis script from the Scripts folder in Project panel to the Main Camera object in the Hierarchy panel. The new script component will be so added to the Main Camera. The purpose of the ImageCapture class is to host the methods necessary to communicate with your Azure Face Recognition Service to analyse the image you will capture, identifying faces in it and determining if it belongs to a known person. If a known person is found, this class will display its name as UI text in the scene. Right-click inside the Scripts folder you have created previously, then click on Create, C# Script. Call the script ImageCapture. Double click on the new ImageCapture script to open it with Visual Studio 2017. To perform a thorough test of your application you will need to sideload it onto your HoloLens. All the settings mentioned in the Chapter 3 are set correctly. 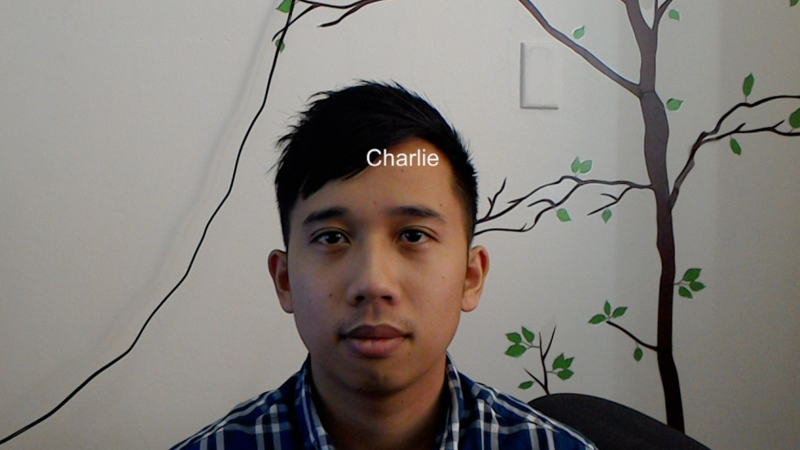 The script FaceAnalysis is attached to the Main Camera object. Both the Auth Key and Group Id have been set within the FaceAnalysis script. A this point you are ready to build the Solution. Once the Solution has been built, you will be ready to deploy your application. Save the current scene by clicking on File, Save. Go to File, Build Settings, click on Add Open Scenes. Make sure to tick Unity C# Projects. Press Build. Upon doing so, Unity will launch a File Explorer window, where you need to create and then select a folder to build the app into. 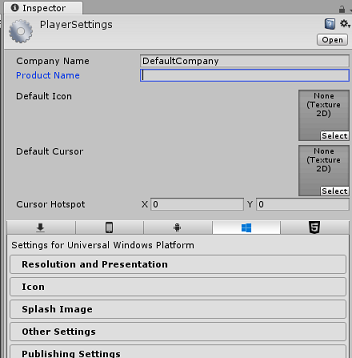 Create that folder now, within the Unity project, and call it App. Then with the App folder selected, press Select Folder. Unity will begin building your project, out to the App folder. Once Unity has finished building (it might take some time), it will open a File Explorer window at the location of your build. Open your App folder, and then open the new Project Solution (as seen above, MR_FaceRecognition.sln). Wearing the HoloLens, launch the app. Use the tap gesture to capture the person's picture. Wait for the App to send the analysis request and receive a response. If the person has been successfully recognized, the person's name will appear as UI text. You can repeat the capture process using the tap gesture every few seconds. Congratulations, you built a mixed reality app that leverages the Azure Face Recognition service to detect faces within an image, and identify any known faces. The Azure Face API is powerful enough to detect up to 64 faces in a single image. Extend the application, so that it could recognize two or three faces, amongst many other people. The Azure Face API is also able to provide back all kinds of attribute information. Integrate this into the application. This could be even more interesting, when combined with the Emotion API.